A man who threatened to cut up a female shop worker "like a pork chop" has been jailed. 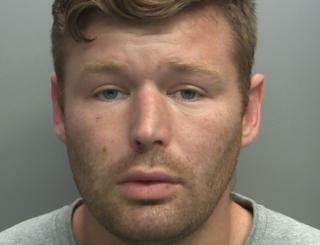 Donovan Andrew Hetherington made the threat while brandishing a scalpel at a Spar store in Carlisle on 28 July. Hetherington, 27, told staff at the Newton Road shop he could take hundreds of pounds from the till "no bother". He admitted affray and having a blade and was jailed earlier for two years. Judge Peter Davies said Hetherington's latest offence was "horrendous". Carlisle Crown Court court heard he had committed 94 offences and was in breach of a suspended prison term. Hetherington, of Linton Street, Carlisle, also admitted escaping from police custody on hospital grounds two days after the Spar disturbance.